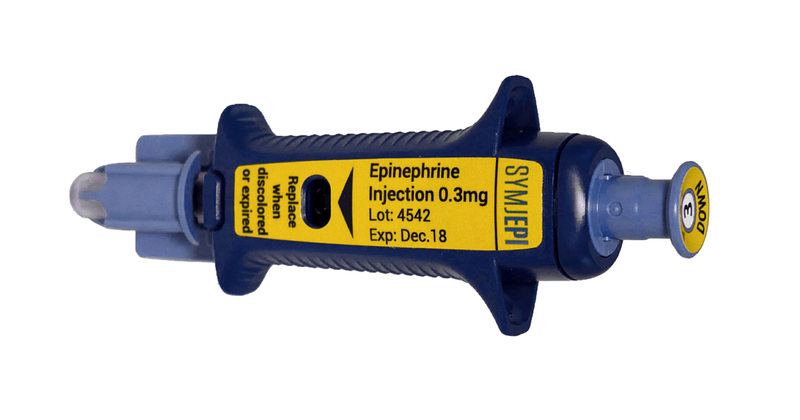 Sandoz Pharmaceuticals announced the introduction of Symjepi, a prefilled epinephrine syringe for the emergency treatment of severe allergic reactions. The Symjepi device is the fifth epinephrine injector on the market, joining EpiPen, the Epi-Pen authorized generic, Adrenaclick and Auvi-Q. Unlike the others, Symjepi is a manual syringe, rather than an autoinjector. While the first impression might be that an automatic injector would be better than having to inject epinephrine manually into the thigh, one study showed that it might not be a bad thing. In the study, teenagers were given both Symjepi and Epi-Pen and were asked to demonstrate using them without any training. The scenario simulated a real-world emergency where someone having a severe allergic reaction may have to rely on someone else to give their epinephrine to save their life. After all, we can't assume that someone trained in how to use the devices will always be around! In this small study, none of the teenagers made any mistakes using Symjepi. On the other hand, three of the teenagers using Epi-Pen held the device upside down and accidentally injected their own thumb rather than the patient. Though Symjepi is a manual syringe instead of an autoinjector, the instructions for its use are printed on the device and its packaging, similar to the Epi-Pen, the Epi-Pen authorized generic and Adrenaclick. In contrast, the Auvi-Q autoinjector is an electronic device which uses a recorded computer voice to tell the user how to use it. Unfortunately, in today’s health care system, it is less about which delivery system for emergency epinephrine makes more sense to you, and more about which one is covered well enough by your insurance to be affordable. However, it is a welcome change that we now have five epinephrine injectors to provide some price competition. We encourage all patients who need to carry emergency epinephrine to call their insurance company to find out what their copays for the various devices might be. We suggest that you discuss that information with your allergist when your current epinephrine injector is about to expire and make sure that you choose the best option for you for your next prescription. Remember to take into account both the ease of use and the out-of-pocket cost for you. We should also take this opportunity to ask you to review your anaphylaxis action plan and discuss it with your allergist. For the most part, if there is accidental exposure to an allergen that is known to cause severe reactions, one should take an antihistamine right away to minimize the chance that any symptoms develop. Even if minor symptoms occur, such as tingling of the lips after eating a food allergen, or a few hives appear after being stung by an insect, use your epinephrine injector right away! There is no way to predict how fast or how far an allergic reaction might progress, so the smart patient uses their epinephrine at the first sign of symptoms to hopefully “nip it in the bud.” Patients with severe allergies have passed away from anaphylaxis with an empty bottle of antihistamines in one hand, and an unused epinephrine injector in the other, presumably because they were afraid to use their epinephrine injector, and were waiting to “see if I really need it.” Always better to be safe than sorry! The most important thing to remember is that epinephrine is not a treatment for a severe allergic reaction - it is merely a tool to keep you alive while you get to the emergency department. Once an allergic reaction starts, there is no way to know how long it will last, and if a reaction is still going strong after the epinephrine wears off in 15-20 minutes, you want to have emergency medical services available to take care of you. If anything in this article sounds unfamiliar to you, please discuss the use of epinephrine with your allergist to make sure you are prepared if the worst happens.